One of the biggest advantages of a heat pump is that it can both cool and heat your home. In the summer, a heat pump works just like a regular AC: it takes warm air from inside your home and moves it outside. But in the winter, a heat pump works like an AC in reverse. That means the heat pump takes the warmth from outdoor air and transfers the heat into your home. We’ll explain how heat pumps take heat from outside air, and we’ll share if a heat pump is a good heating option for San Marcos homes. Have heat pump questions? We have answers! Heat pumps remove heat from outside air using refrigerant, a liquid/gas that absorbs heat. 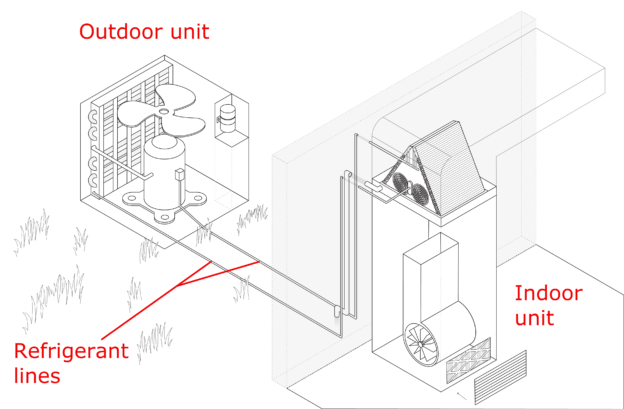 Refrigerant circulates from the indoor unit to the outdoor unit (pictured below) in a closed loop. 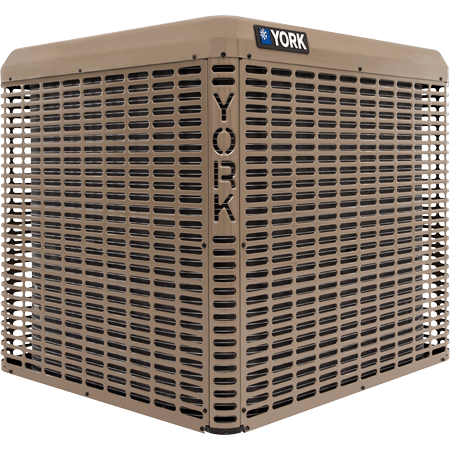 In the summer, your heat pump uses refrigerant just like a standard AC: it absorbs heat from inside your home and dumps it outside, which is how your home stays cool. But in the winter, the refrigerant does the opposite—it absorbs heat from the outdoor air and brings it inside to warm up your home. So how can a heat pump switch from cooling your home to heating your home? Well, heat pumps have a component called a reversing valve. This valve changes the direction of refrigerant flow in your system depending on the what the thermostat is calling for. Believe it or not, winter air still has plenty of heat for the refrigerant to absorb. In fact, there’s still enough heat in the outside air for a heat pump to do its job when the temperatures are as low as 5° F.
Resistance heating refers to electric heating coils that are installed in your HVAC system. These coils begin to heat your home’s air as the heat pump starts to lose efficiency because of the colder outdoor temperature. You’ll know if resistance heating is kicking in if you see the phrases “AUX Heat” or “Emergency Heat” on your thermostat. The downside to resistance heating is that it’s not energy-efficient, which means you’ll have higher energy bills if you rely on it for long periods of time. Note: The most cost-effective heating option is a dual fuel system. A dual fuel system consists of a heat pump and a gas furnace. When the heat pump can’t provide sufficient heat for your home, the gas furnace will kick in (instead of electric resistance heating). Since natural gas is a cheaper fuel source than electricity, you’ll cut down on your energy bills during the winter. So, are heat pumps a good fit for San Marcos homes? Now that you know a little more about heat pumps, you might be wondering if they’re a good fit for your San Marcos home. The answer? Yes, heat pumps work well in the San Marcos winter climate. Since heat pumps simply move heat rather than create it, they can heat homes for as little as ¼ of the cost of conventional heating appliances. So if you’re looking for a new heating system, a heat pump is a solid option. Plus, outside temperatures don’t often drop below 32° F during the winter months, so heat pumps are normally capable of heating your home comfortably on their own. And for the few days that are below freezing, you’ll have resistance heating to help keep your home comfortable. Have more heat pump questions? We’re happy to answer questions. If you’d like to learn more about heat pumps, read our related articles below. Interested in getting a heat pump for your home? Visit our heat pump install page for more information about how the installation process works.